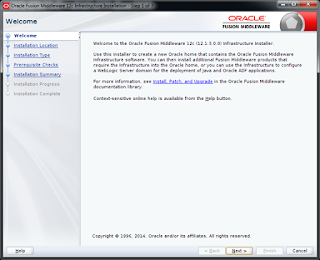 This blog provides instructions for installing and running the Oracle installer for Oracle WebLogic 12.1.3. 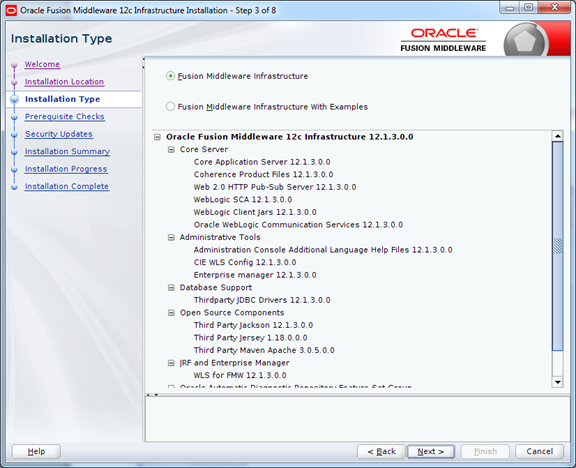 Oracle WebLogic 12.1.3 supports Oracle JDK 1.7.0_55+ version. Oracle JDK can be downloaded from the Oracle Software Delivery Cloud. This article assumes you have an existing server (real or virtual) with either Oracle Linux 5.x or 6.x installed on it. Let's see how to install, Oracle Weblogic Server 12.1.3 on linux. 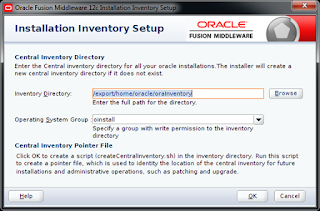 1) Install Xming on the machine from where you want to make the installation. Xming is used to work with the user interface during installation. 4) Login into the putty with the suitable privileges, navigate to the location where you have kept the weblogic installer and run the below command from putty. 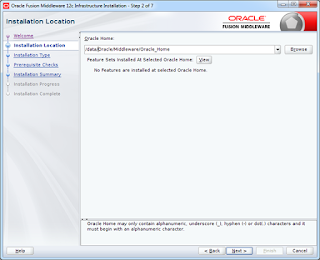 5) After successfully extracting of .jar file, Oracle Weblogic installation will be started as shown in the following screen shot. Simply click the OK button. This is the inventory path. 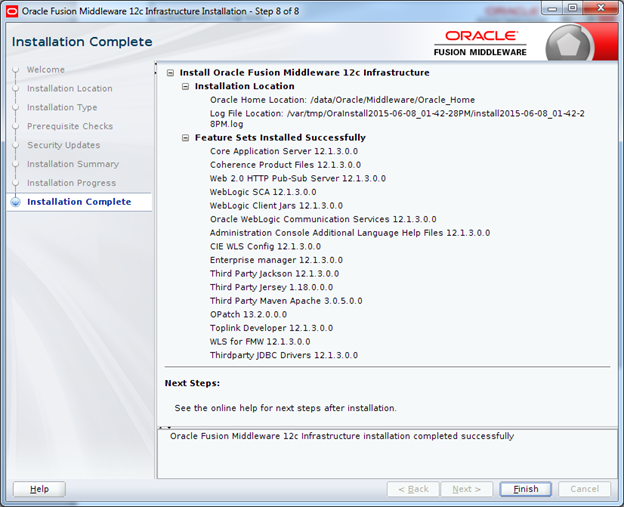 6) On Installation Location, provide a location for the home for this installation of WebLogic. 7) On Installation Type, select the type of installation you wish to perform. 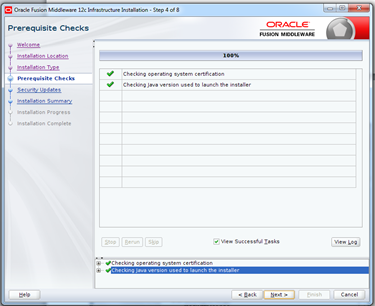 8) The installer runs Prerequisite Checks and shows progress. If the checks are successful, click the Next button. 9) The Configure Security Updates window appears. 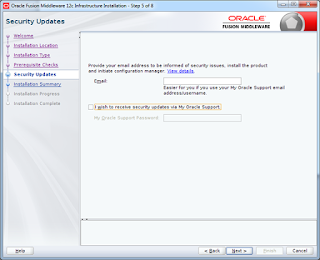 Enter your email address and My Oracle Support password to receive security issue notifications via email. If you do not wish to receive notifications via email, deselect "I wish to receive security updates via My Oracle Support". Click Next to continue. Click "Yes" in the confirmation window to confirm your preference. 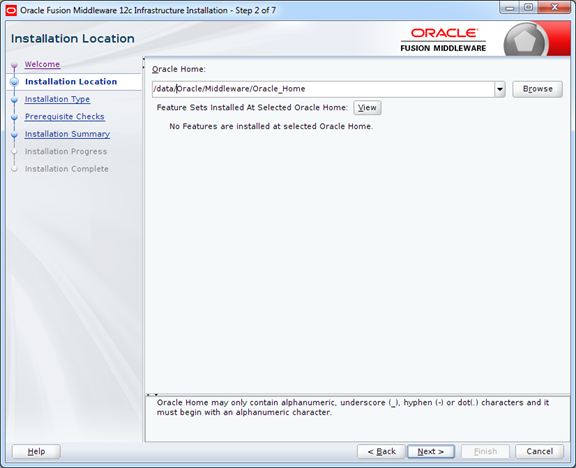 11) As the installer begins a progress bar is displayed on the screen and displays the new features of the Oracle WebLogic 12c. 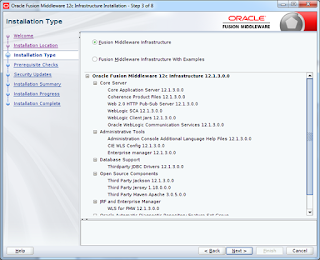 MaxMunus Offer World Class Virtual Instructor led training on Oracle Weblogic Server. We have industry expert trainer. We provide Training Material and Software Support. MaxMunus has successfully conducted 100000+ trainings in India, USA, UK, Australlia, Switzerland, Qatar, Saudi Arabia, Bangladesh, Bahrain and UAE etc.